Macklemore and Ryan Lewis have released an eight-minute song featuring Jamila Woods, “White Privilege II,” about white privilege, beginning with Macklemore’s own feeling about whether he can meaningfully participate in a Black Lives Matter march and spiraling into different movements questioning what his own white privilege means. On a certain level, “White Privilege II” is Macklemore acknowledging his core audience; this song is not necessarily for people of color, it is exactly for the presumably young white kids who consume his every move but perhaps don’t listen to other rappers, as he points out with an interlude in the song. (“You’re the only rap I listen to” when leveled at non-black rappers is thinly veiled code for racial bias, and is no doubt constantly leveled at white rappers like Macklemore in particular.) It is the sound of Macklemore (aka Ben Haggerty) trying. 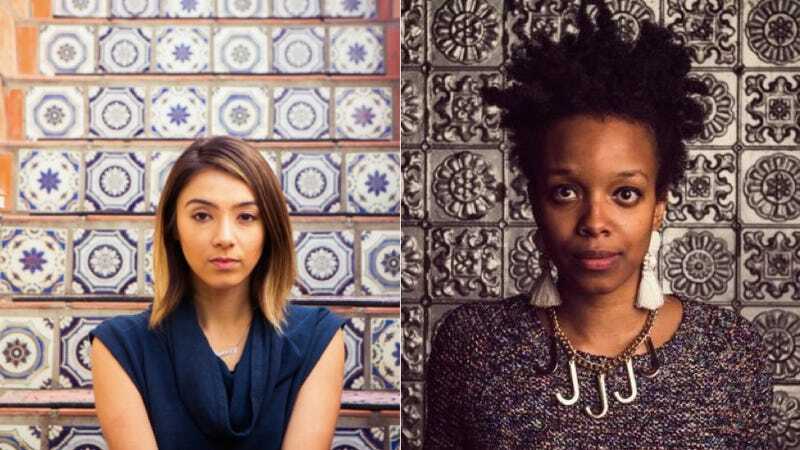 It’s to the rapper’s credit that he asked two, very talented women of color—Seattle musician and longtime collaborator Hollis Wong-Wear and Chicago singer Jamila Woods, both activists—to work on this song in an active and meaningful collaborative way. Jezebel spoke with Wong-Wear and Woods about the thought process behind it, and where they’ll all take it from here. JEZEBEL: How did you come to work on this song? Hollis Wong-Wear: I’ve been working with Ben and Ryan for years now, on and off, in a variety of different capacities. I guess my involvement in the song really started with conversations. When we get together we start from a place of exploratory creative writing—not sitting down to write a song but just processing, and that’s been part of our creative relationship for a number of years. After that moment of the non-indictment of Darren Wilson, Ben had reached out and was processing. I’ve been open to talking with him as a sounding board. I said, you know, these questions would be really cool if we pulled in somebody who’s on the ground and organizing under the banner of Black Lives Matter in Seattle. So we pulled in my friend Nikkita Oliver, an amazing lawyer and activist, and we really started having an in-depth conversation about what does it mean for Ben to authentically leverage his privilege, his platform, his wealth, his success. Jamila Woods: Hollis called me one day and was like, Hey, would you be comfortable talking to Ben about this? I had a phone conversation with Ben where he said, I’m gonna play by play all the things I’ve written so far and if that sounds interesting to you, I’d love to have you come out and just listen to the song and talk about it and see if it’s something you could be involved in. Hearing him describe it, one of the things that first struck me about it was that it was tackling a multitude of issues. I thought it was interesting to think of that sort of intersectionality of a white artist in hip-hop, and cultural appropriation, and how white people can be involved in black liberation struggles. How all of that is interrelated really stuck out to me as a unique angle. I wanted to hear it and coming out [to Seattle] was very low-pressure; it was like you can come, you can hear it, you can leave, it wasn’t agreeing right away. But it definitely took being in the room and talking about the issues. It was a really process-oriented thing and the conversations we had were just as important, if not more so, than the actual product. That process is really interesting—that you spoke with him how he could leverage his position for activism. Woods: I think part of it was when I got there, the song wasn’t all the way conceived. Parts of it were, but parts of it weren’t really working. For example, the parts where you hear people talking was something we came up with all together, because it was wanting to represent these different voices but in a more authentic way than us scripting it ourselves, imagining what people would say. We came to the idea of actually talking to people and hearing what they actually thing. When I said, Yeah, I’m down to write something, the prompt was initially a call to action for the audience. A while of it was figuring out how to wrap my mind about how I would enter the song, because writing with a specifically white audience in mind and a call to action to this subject was something I never thought about, ever. So it was like, What do I say, and how do I say it? We had a lot of conversations like that. Wong-Wear: There was a lot of analysis about bringing in a collaborator and bringing in a featured artist like Jamila, ensuring that it was done in a way that amplified her perspective and her artistry, and wasn’t used as a crutch… Ensuring that it was a true collaboration, not just a coda. Woods: I was thinking about, in general, in conversations around race, the burden on people of color to explain and have all the airtime. The intention of the song is to reach a white audience or at least an audience that’s not always engaged in these issues, but to me the only part that felt natural was at the end, and to insert myself when I felt like I didn’t have anything to say at that moment didn’t really feel right. Yes—and you making sure that it was a true collaboration did immediately bring to mind the idea that white people are often looking to people of color to explain racism and white privilege to them. It’s interesting to hear the song, because I don’t know of a case where any other white pop musician has discussed this so explicitly, to this degree. In conversations, was he very mindful about the collaboration aspect? Woods: I feel like it was a learning process, because I feel like—I can’t speak for him, but from the perspective of it wanting to be a collaborative process, usually when you collaborate on the song, you really want to share airspace with your collaborator. But in this case, Ryan or Ben would be like Oh, it would be great to have you here, but I would be like No, I think I’d be better here; I think we learned through the process about what felt right. Hollis, just to be clear, what was your exact role in the process? Wong-Wear: I was almost in an advisory capacity. There were a couple days of really intensive 12-hour sessions with me and Ben and Ryan and Jamila, writing, ideating, reading and incorporating, talking things out, saying something and realizing it was problematic and editing. I really enjoy digging into the creative process and, really, just being a steward of creative processes. I realize these are a lot of vague terms; I’m a songwriter, but a lot of what I was drawn to and what I found really meaningful was more navigating and connecting this process to the larger community, whether that was in Seattle or beyond. And just thinking about both the micro-moment of this song, and where it is situated on a point on a continuum for Ben and Ryan’s company. A lot of the conversation was just like, Is this going to be a good thing in the world? Does this need to come out? That’s not to forsake the creative process, and I understand that sometimes processes happen without any explicit or external product, and that’s okay and sometimes that’s best. Navigating those questions was a large part of my involvement, which I really enjoyed, because it felt like an authentic place of leadership. Woods: I really think the whole process would not have been possible without Hollis. It felt like the writer’s block or standstills that happen between people trying to make something together, Hollis would be the un-blocker of those things. Like, constantly thinking about how to change the perspective, or think about a thing from a different angle. If we were in a workshop, she was the facilitator. What do you mean about this song just being one point on a continuum for Ben and Ryan’s company? This song is a conversation starter, not something you just drop and just move on. What comes after this? Wong-Wear: The company has initially engaged with four different entities listed on the website of the release, and each of those organizations are deeply invested in direct action mobilizing or anti-racist education curriculum and modes. Each showcases a breadth of leadership approaches. Each of the organizations are points of reference and insight for their company, and the ones that have really just been doing the work. I think that’s a lot of it: what is the place of an artist-activist? What is the place of an aspiring activist who wants to be involved? And it has to come from the insight and the leadership of those who have been doing the work and leading the movement for years. I think to that end, there was obviously a concerted commitment to ensure that this wasn’t a finale of any sort. This is the conclusion of the process of the song—the song is released now—but this is the first moment for them to be explicitly working to align and support with that kind of organizing. Woods: Thinking about ways to engage with the song and not only online but in person with community organizations; bringing in different groups of people who might not ever be in the same room discussing this topic is something we’re working on as well. In Chicago, and other places where we have networks, we’re trying to bring the audience that would respond on Twitter, the Macklemore fanbase from college campuses in the area or people who hear that the event is coming, and then also different local organizing groups. And then young people that would respond to the song in some way artistically. I work at a nonprofit where we do spoken word poetry and hip-hop in high schools, so the idea of also featuring young people of color responding to the song in addition to discussing what are ways people could tangibly be involved in issues that are specific to their local place. In working on this song, who did you perceive the audience to be? Woods: At one point, we imagined a sector of people who would listen to the song, white listeners, who may be offended or alienated by it. But also, I think part of the issue that the song even mentions in the scene of Ben at a protest and not knowing how to participate—or if he should participate—that’s something I’ve just seen people express. Even at protests. Sometimes there are issues where there are white people participating in protests and then the people of color who are leading the protest feel like it’s not the most productive way. I think there are a lot of white people who would feel maybe this is speaking to that feeling. Whether or not they totally agree, it’s always good to name those things. Even though the answer is definitely not put forth in the song, it can encourage people to discuss that. Otherwise there can continue to be silence about it, or people feeling isolated or like it’s not something they can talk about. Wong-Wear: Again, talking about the nuanced dynamic of elevating voices of color without hiding behind them, I think that we have seen such an absence of white people in mainstream media call attention to racism. The more comfortable that white people with influence are with engaging in these issues without being afraid that they’re doing it wrong, or whatever. I think that white privilege even is difficult for white people to wrap their heads around, and there’s so much defensiveness and personalization with it, and if there’s any influence that can get white people to stop taking what it means to be racist personally, it’s deeply important. Because that’s the only way that work is going to begin: if white people really start understanding what it means to be racist. It’s really important for white people to understand what white supremacy means; that it’s not necessarily an extreme thing, but it defines the way that every system we live within operates. Being able to use that language—for white people to be able to have it in their mouths—is important. I don’t think it gets put there, unfortunately but expectedly, unless somebody white tells them that it’s important. Because that’s the way white supremacy works! Yes, the irony, using white supremacy to battle white supremacy. Wong-Wear: Yeah! I think Nikkita said it really well: she said this song is the product of a system. What does it mean that this song will have the reaction that it will have, and will it be effective in engaging white people who don’t see this as part of their experience? Because white people don’t live in a racialized world. Jamila Woods’s upcoming album is out this Spring on Closed Records. Hollis Wong-Wear’s band The Flavr Blue’s new album is out now, and will tour in February.